Lærke Andersen, a former student of Central Saint Martins in London, has come a long way since she launched her AW15 collection. 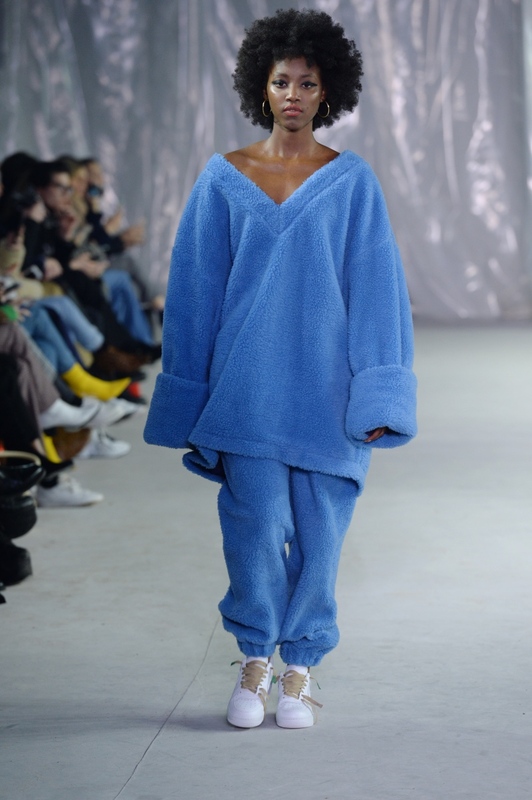 In 2017 she won the Magasin du Nord Fashion Prize and this year she was ready to show off her AW18 collection at Copenhagen Fashion Week and she did so with a bang. 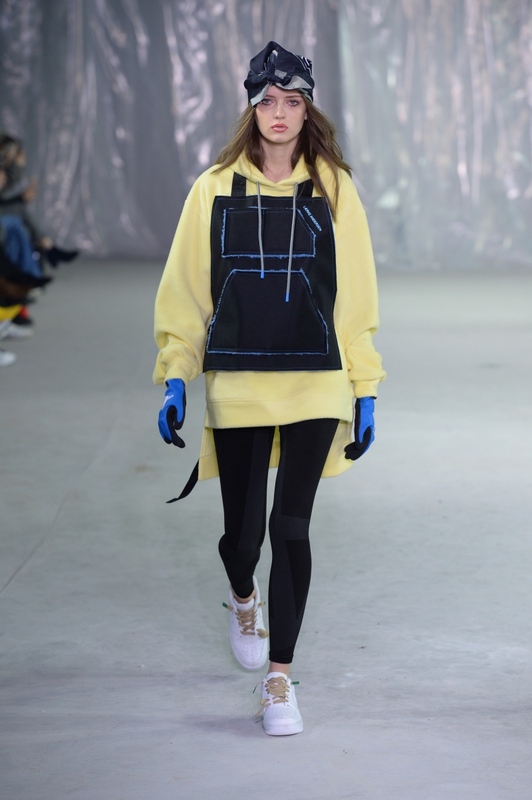 Lærke Andersen's work incorporates sport and workwear (something in the grey area of athleisure), which was obvious when the models came down the catwalk. 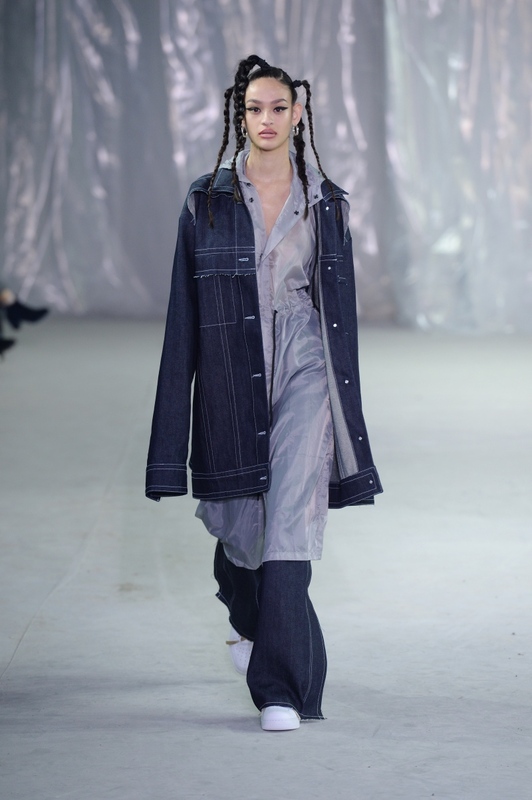 The show took place in an industrial warehouse which complimented the feel of the collection and fitted the inspiration with its rawness. 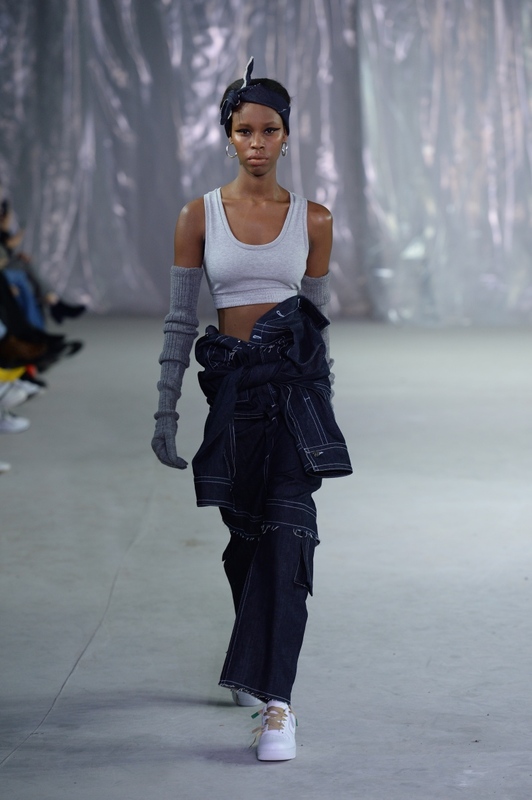 The collection contained a variety of pants, sweatshirt, dresses, skirts, and jackets done with a mix of materials to create an exciting look, making it easy to look both fashion-forward and handling of the Danish winter. The color range suited the styles and went from dark green and blue to pastel yellow. Of course, the colors black, grey and white were represented as well, it is Denmark after all. 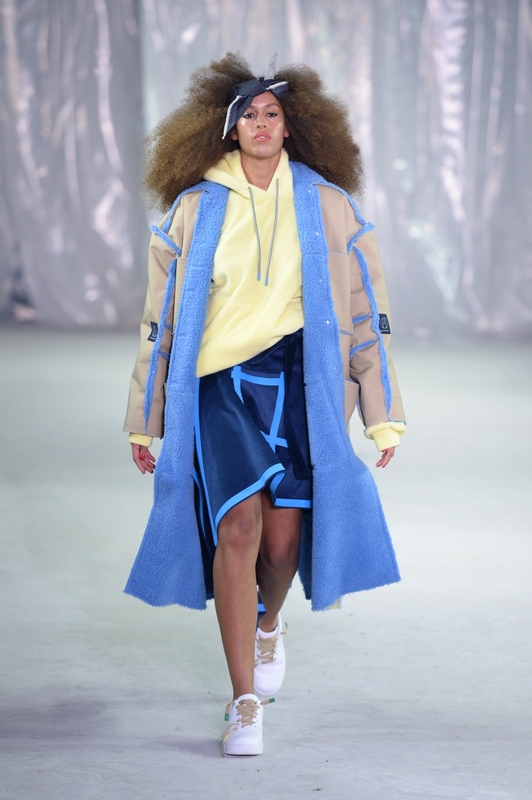 The inspiration from sports was seen through tights that looked like fashionable styles for the gym as well as sweatpants and sweatshirts while workwear was shown in the visible seams and in the materials like canvas used for jackets. There were also several styles made of denim, which sends thoughts back to durable workwear worn by the gold miners in the 1870’s. The mix between the two inspiration sources worked well together, giving a strong street feel. She furthermore has an interest in making both the masculine and the feminine details come together as well as merging function and luxury. This was shown in voluminous silhouettes, while the feminine details were seen in buttons, slits, tops, and ruffles. The materials used in the collection was a mixture of both masculine and feminine. The canvas versus the teddy bear fabric, see-through material, and velvet. She melted function and luxury together by using luxury material and making styles with a functional use to them. 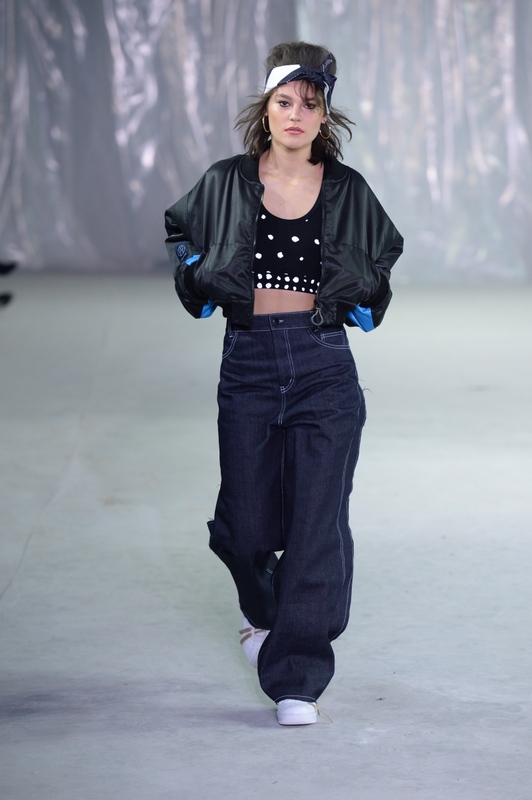 Lærke Andersen incoporates true to her design DNA by using former design elements like denim or evolving former details for this collection, for instance, the feminine polka dots from former collections, that she evolved and gave a distinctly high street meets low street expression. 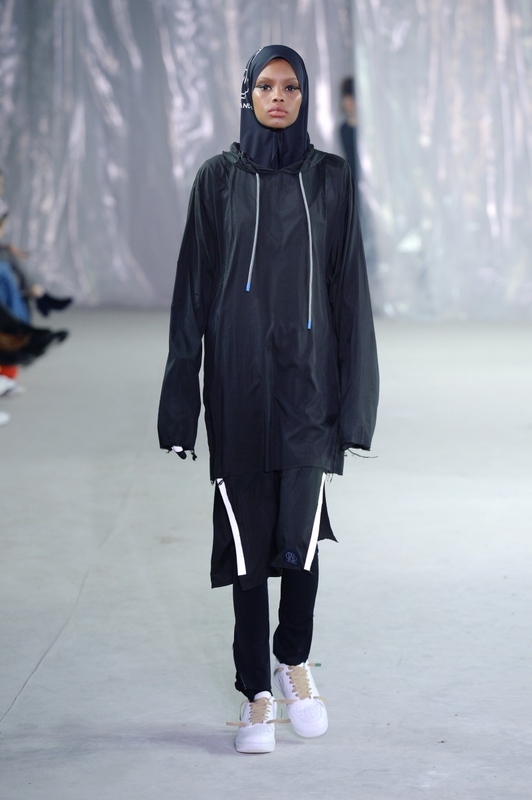 This is slow fashion done right.